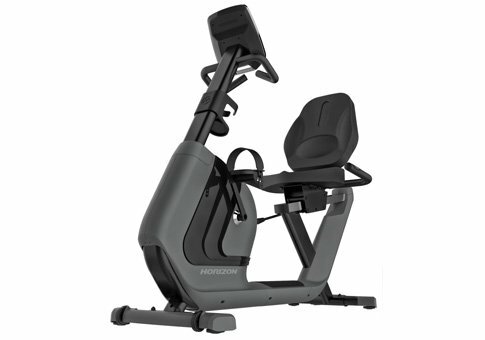 The Horizon Comfort R is a well-designed recumbent exercise bike, with a quiet, smooth magnetic brake resistance system, nice workout options and heart rate monitoring. With its small footprint and portability, it's a good choice for the home user. The 5.5" LCD display shows you calories, speed, resistance level, distanece, time, heart rate, watts and workout profile, along with the CardioCompass readout to help you stay in your ideal zone. Get the popular Comfort R recumbent at the Horizon store now! 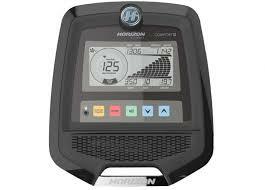 The Horizon Comfort R is a well-priced option, and expert reviews have been positive so far. it is one of two recumbent choices from the company, along with the up level Elite R7 bike. The Comfort R has a nice design, and it's easy to get on and off as you can step right through the middle of the machine, unlike on some recumbents where it's just one solid piece. 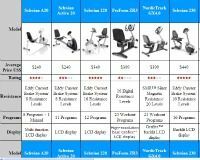 Just like its sister model, the Comfort U Upright, you get to choose from 10 workout programs, including intervals, game, weight loss, random, target heart rate, rolling hills, constant watts, custom and manual. 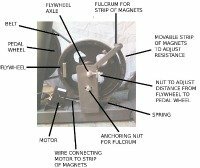 You also have 16 levels of ECB magnetic resistance which are very smooth and quiet. You have handlebars on the seat itself and on the console, so you can switch it up throughout your workout. The pedals have adjustable straps and the seat is large and comfortable. The display is very basic but it gives you all of the important workout stats. The Elite R7 model gives you a much more elaborate display, as well as workout tracking, but it is about $300 more than the Comfort R model. It also includes the wireless receiver, which the Comfort R does not. User reviews are mostly positive...they enjoy the workout they get on this recumbent, along with the comfortable seat and ergonomic grips. They also like the fact that the bike does not take up too much space, and that they are able to store it away easily after their workout. Other plusses include the Energy Saver mode, built-in speakers, a reading rack and a water bottle holder. For those in the market for a good recumbent bike, the Comfort R is a good choice. At only about $799 or so on sale, you get a nice amount of workouts and resistance levels, plus plenty of adjustability and comfort. The bike is quiet and the motion is smooth. It's also very easy to lift and store away, and doesn't take up a lot of room so is ideal for smaller spaces. If you want a little more tracking ability, and a more higher-end machine, look at the Elite R7. For just a few hundred dollars more you get ViaFit workout tracking, more resistance levels and programs and a free wireless chest strap.